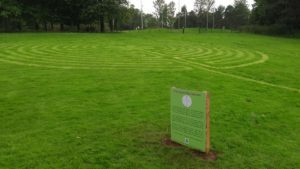 The labyrinth in Riverside Park was laid out on in August 2017 and is available for anyone who would like to walk the labyrinth. Thank you to Peter and Heidi Gardner for the layout, to Jim for his help and to Mike and Grant for the cutting. Labyrinths have a long association with pilgrimage. This design is from the 12th century labyrinth in Chartres Cathedral. You are invited to walk the labyrinth. This is usually done by entering at the opening and then slowly following the path to the centre. Many people like to pray or quietly reflect as they walk, pause in the middle and then retrace the path back out. The labyrinth in Riverside Park is between the wildlife pond and the skate park. It was created by Peter Gardner, Pioneer Minister to the Visual Arts Communities of Glasgow, has been sponsored by St. Columba’s Parish Church and is being maintained by the Fife Council Area services Parks, Streets and Open Spaces team. In November 2018, Susan Brown, the Moderator of the General Assembly, visited the Presbytery of Kirkcaldy and walked an 8 mile section of the Pilgrim Way from Kinglassie to Markinch with about 20 others. This is a picture she took of some of the “pilgrims” walking the labyrinth.